Operation Highjump was launched a year after war’s end to train Navy personnel in the extreme temperatures of the Antarctic and to project American power over the vast, frozen and uninhabited continent. More than a dozen ships, several aircraft and 4,000 men participated in the fact-finding expedition, which ended six months ahead of schedule in February 1947, when terrible weather conditions made it impossible to continue the effort. That, anyway, is the official account. The conspiracists among us will wonder if the fatalities and plane crashes involved in Highjump weren’t caused by something other than snowstorms and the lethal cold? Whatever the validity of El Mercurio‘s reporting, the phrase “from pole to pole” could imply a permanent German presence in Neuschwabenland, or New Swabia, the slice of the Antarctic which the Kriegsmarine had surveyed in 1938. 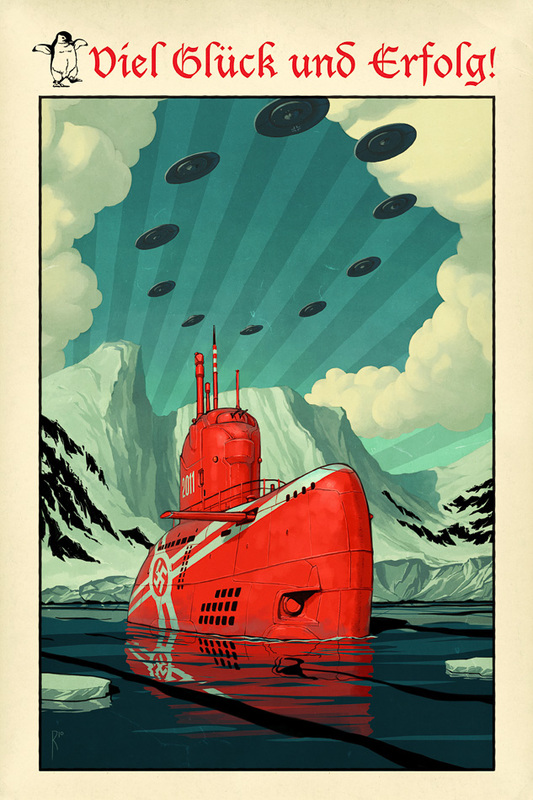 Although there is no evidence to suggest that Nazi Germany undertook any more Antarctic expeditions during the war, conspiracy theories abound that claim it did exactly that and built an underground facility near the pole while it was at it. Part of New Swabia isn’t that cold and in fact features a couple of mountain ranges that are ice-free the year round. As evidenced by the large Mittelwerk missile assembly site, the Nazis had ample experience tunneling and building underground based and factories. Although it would have required quite an effort, it is not altogether unimaginable that Germany erected a secret facility in or near the Antarctic Schirmacher Oasis, which the 1938 expedition had discovered. With more than a hundred freshwater lakes and outlets to the sea, it could also have serviced German U-boats. From this point onward, the myth usually begins to include exotic German aircraft designs, Hollow Earth theories and Alien Reptilians conniving with the Nordic Herrenvolk to subjugate the human race. It seems there’s a whole lot of trouble waiting to be uncovered down there! If the Nazi polar base thesis seems to hinge on little more than a few curious statements and coincidences, that’s because most conspiracy theories do. This one does set the stage for a great dieselpunk story, though! This story first appeared in Gatehouse Gazette #20 (September 2011), p. 22, with the headline “Nazis in the Antarctic”.